Trends take a long time to pass don't they? My theory, based on personal observation, is that more than fifteen years can pass before they have completely filtered through the trend cycle from innovators and early adopters, to the dregs of the high street. When I moved to the UK back in December of 2002, my husband had recently purchased a red Smeg fridge. Just saying that, you probably know which fridge I'm talking about. Yep, the retro FAB model, still loved by so many all these years later. Except me. So as you can probably guess, I never did like that fridge. Over the years I came to resent it more and more. Unreasonably so. It didn't have a proper freezer. It had an internal ice-box style freezer instead. Basically big enough for a couple of trays of ice, a bag of frozen peas and a small box of fish fingers if you packed it efficiently. It was, as far as I was concerned, a bachelor fridge. We became parents. I used to wait, and hope and pray that the fridge would break down so I could justify buying a new one - a 'proper' family fridge. It didn't die. Parts, like the plastic door shelves would break, and be horrifically expensive to replace. The ice-box door broke, so that every time you opened it, the entire door would come off in your hand, but I refused to spend £100 (yes, really) on a new door, so we just lived with it. Just like the cheap sunglasses that you never lose, that fridge just wouldn't quit. It was mocking me, I'm sure. In fact, for over TWELVE YEARS I wished that fridge would pack it in. It didn't. I guess that's testament to the motor of a Smeg fridge. It wasn't until some friends were ripping out their entire kitchen and offered us their mammoth American style fridge-freezer two years ago, that I was finally able to send that red fridge on it's way. I love our 'new' fridge. Again, perhaps more than is reasonable. It's massive, and I couldn't wait to fill that freezer with all the things a family 'needs'. No longer did I have to consider whether buying a tub of ice-cream would result in having to throw away a perfectly good bag of frozen peas. Would the vodka have to come out if I bought that extra chicken? Priorities. Why did I put up with something I hated so much for so long? Well, I'm not entirely sure. I think I hate waste in nearly equal measures. That, and I was sure it would break soon. In hindsight I could have sold it and bought a less-offensive cheaper one. Hindsight is great isn't it? I often think about what fridge I would get when we one day do our kitchen. Would I want something integrated? Or with a water and ice dispenser? You might be surprised to hear that the number one contender is in fact a Smeg. I don't have an issue with the brand you see. Who could blame them for milking the retro cash-cow for all it's worth after all? But of course, this model isn't readily available in the U.K, probably because everyone here is still so fixated on the retro FAB one. Google 'smeg fridge' and what do you see? Please, let's move on from that so we can have different and contemporary models on offer like this absolute stunner (yep, I just called a fridge stunning). 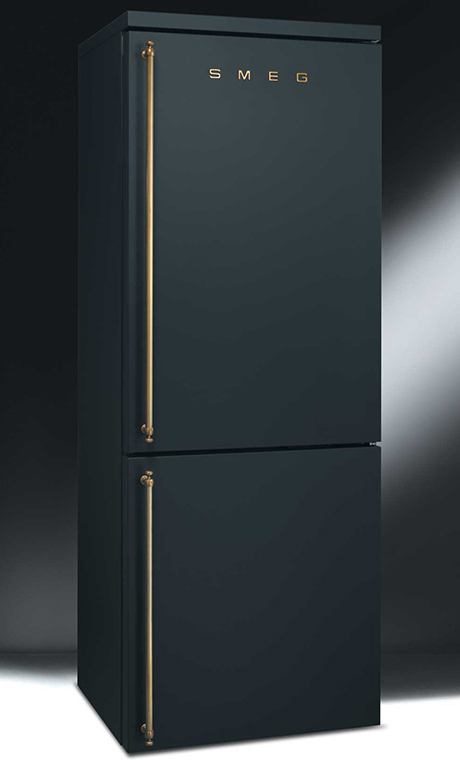 The Smeg FA800AO is matt black with brass handles, and would look so amazing in the Fantasy House Kitchen. What ever-lasting trends are getting your goat right now? I have a few others of course, including the Pineapple sadly, which is in serious danger of becoming the new 'Keep Calm'.